Labour continually claim that the Council Tax freeze is regressive (bad for the poor), and that it is the cause of cuts to council services. I’m not sure if they are lying or just stupid. It should be remembered that the council tax is only a slight variation on the poll tax. The owner of giant mansion pays just three times as much tax as the owner of a one bedroom council flat. Wings Over Scotland reported last year on an academic finding that “raising Council Taxes actually raises inequality.” Council Tax is regressive, and freezing it helps the poor. Of course, taxation is only one half of the equation. The poor access more public services than the rich, and so suffer greater harm from cuts. 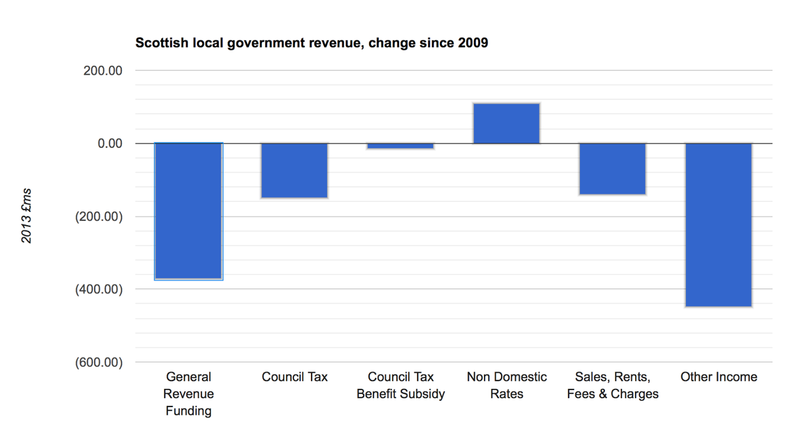 Has the council tax freeze harmed council budgets? I had a look at the figures. 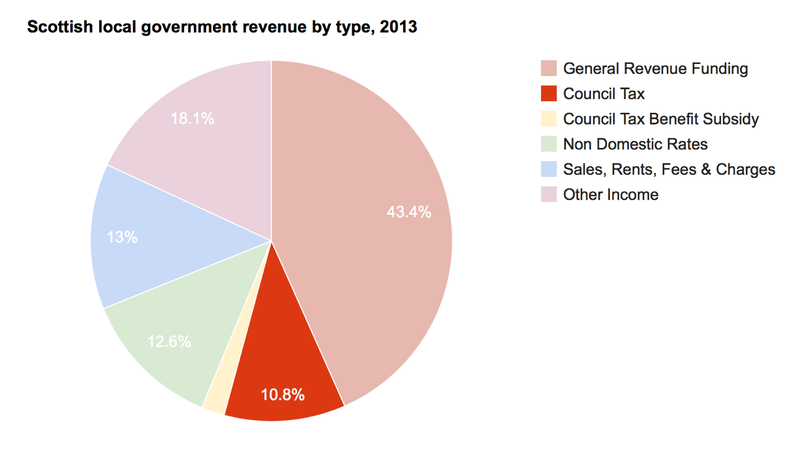 The first thing to notice is that Council Tax makes up just 10.8% of Council income. Changes in Council Tax revenue are 14.7% of the total change in the budget, £149m of the cuts. 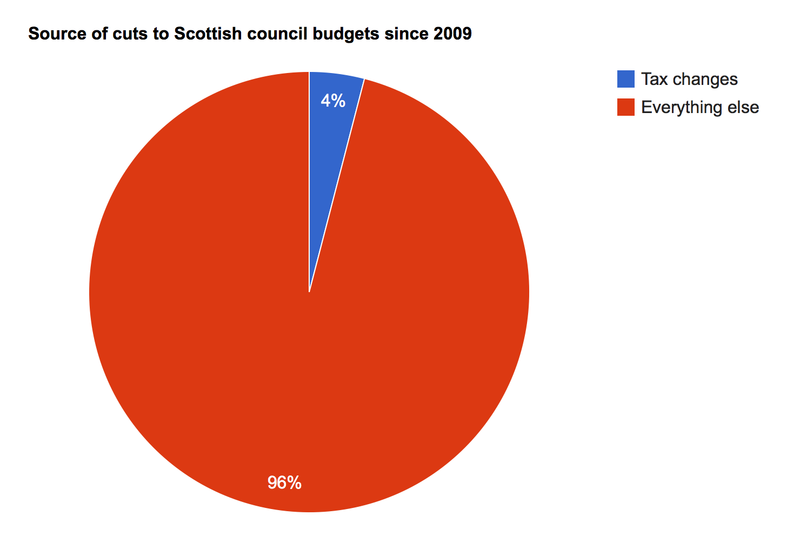 This figure includes losses from Council Tax cuts, such as the cut by Stirling’s Labour / Tory coalition in 2012. Meanwhile, business rates have gone up by £108m! The net effect of tax changes is £41m of the £1,015m cut to Scottish council budgets since 2009. Even by Scottish Labour standards it’s one hell of a bending of the truth to blame cuts in council services on the Council Tax freeze. The fall in sales, rents and fees, presumably a result of the recession, is around the same size as the council tax changes. Both are dwarfed by the £371m fall in General Revenue Funding and a £448m fall in “Other Income.” I couldn’t find a clear definition of Other Income, but cross-referencing with the Scottish Budget suggests that it is mostly miscellaneous central government funding. Around £1bn of cuts have been made to Holyrood spending on local government since 2009. The cuts to council funding from central government are severe, but must be seen in the context of Westminster’s £3,737m per year cut to the Scottish departmental expenditure limit since 2009. Local government cuts are caused by Westminster block grant cuts, not by the council tax freeze. In fact, that SNP have reduced a regressive tax on homes and increased a tax on businesses. Tartan Tories, my arse. It’s not just Labour who call the freeze regressive – I’ve seen Greens saying it as well. I’ve never understood the argument myself – if a tax is regressive, as the council tax so blatantly is, then how can it be regressive to freeze it? I’d like it gone, and Swinney made noises around the time of the budget that suggested there might be another attempt to look at replacing it, but in the meantime a freeze at least reduces its impact on folk. In the block of flats I stayed in when I lived in Glasgow, there were something like three different bands in the one building. That just seems ridiculous to me. People on in-work benefits or other state benefits should be excluded from council tax altogether. Council tax on properties in the brackets of 1m, 1.5m, 2m, 2.5m, 3m should be charged (relative to their value) a substantial amount more to make up the shortfall. I just think it is absolutely ridiculous that people are taxed on the value of a home they might not even own or be able to afford to own! Needs to be an income based tax. Simple & fair. I ran a little spreadsheet showing how my council tax rose year by year. Under Labour/LibDems, it had risen from £129 per month in 1998/9 to £220,10 by 2007/8 – that is a 73% increase in 9 years during which time my earnings certainly didn’t go up by that amount. Under the SNP, from 2008/9 to 2014/15 it went up from £220.10 to £226.60 (water charges) – that’s just 2.95% in 6 years. My wages haven’t gone up that much in this period either! The politicians, especially the ones who have only ever worked in politics or the public sector, complain about the freeze starving councils of money without realising that increases starve the council-tax payers of earned income that they should be free to spend instead of seeing councils frittering money away on vanity projects and junkets. The SNP have been in coalition in my local council since 2007. Since then, council budgets have been salami-sliced every year. I’ve watched the budget for my kids’ school stripped back to the bone. The head has a discretionary spend (i.e. everything that isn’t a salary) equivalent to what my local private school spends on its annual musical production each year. One of the areas impacted by continuous, year-on-year budget cuts is provision of specialist music tuition. Fewer children now have the chance to learn a musical instrument in school, for free. The provision is now pretty paltry. Meantimes, I have gained a few hundred quid a year from the council tax freeze. I’ve spent that money on getting my kids music lessons privately. My kids’ best friend, from a single parent family dependent on income support, has made no such gain, as they were receiving council tax benefit. This friend didn’t get selected for free instrument tuition at school and they have no extra cash courtesy of the council tax freeze to spend on private tuition. The council tax freeze is not the main cause of the terrible cuts you describe, cuts to the Scottish block grant from Westminster are. That is the point of the article. Nonetheless, without the council tax freeze, local councils in Scotland could decide to take more council tax from someone like me to maintain school budgets (or budgets in other areas) so that my friend’s family had a better chance of gaining access to free music tuition, which they couldn’t afford to seek privately. And interestingly, some local councils in Scotland have better protected this particular element of schools budgets than mine. Good old-fashioned redistribution, of which we hear much talk but precious little action. The council tax is regressive, it is not redistributive. A blog about thoughts I've had. Content licensed under Creative Commons Attribution-NoDerivatives 3.0. Worried about the #indyref polls? Read this.